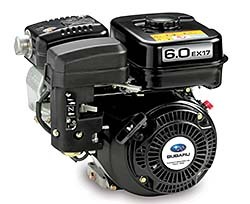 The EX Series features five models with power ranges from 4.5-14 hp and uses high performance chain-driven overhead cam technology. The engine is designed with an efficient pent-roof-type combustion chamber, using a high compression ratio, producing higher power and torque while limiting exhaust emissions and fuel consumption. The automatic decompression system reduces the required recoil pulling force by 30-40 percent compared with overhead-valve engine designs, helping make starts faster and easier with no perceptible kickback. The series is covered under a five-year limited warranty.